NOTE: The lead time will increase by about 5 more business days with the pad zipper mod. Double doors are now standard and your spreader bars now go on the outside of the Spindrift for easier access. We trimmed the bottom portion slightly and also added an optional “pad zipper” mod to the order menu. 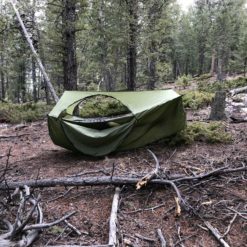 A pad zipper on the head end cap allows for much easier pad insertion and is recommended for anyone who regularly uses a sleeping pad as their bottom insulation. I have purchased two RR’s , one for my wife and one for me. I had held off for a year on purchasing the Spindrit because I wanted to watch what others would think. I’m glad I did because in that year Brandon made available a add on zipper on the double layer RR. This allows you to put in your choice of air mattress. I use the Static-V inolated by Klymit. I find it fits perfectly like a hand in glove in the double layer RR. , zippered opening optional. As for my purchase of the Spindrift, like all other reviews, I am glad I sprang for it . I bought one to try out and let me tell you I have nothing but praise. This will be my fifth week using it and have been though rain and one wind storm that lasted 3 day with gust of 35mph. Mind you I also purchased the Thunder Fly tarp to cover the Spindrift from driving rain. 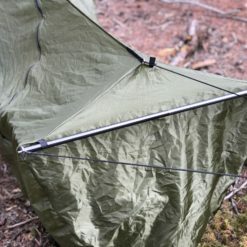 The wind one night did uproot my titanium stakes and spun my Mountain Fly around which create two small holes in the Thunderfly while I was sleeping . The gusts and flapping tarp woke me up and I reset my stakes and place large rock atop the stakes which held. The Thunderfly held up like a champ the rest of those winds and did not tare. The lowest temp so far had been 28 degrees . If not for the Spindrift I would have felt that bite. But just useing the bug net alone will retain some heat and blocks some wind. But not anything close to what the Spindrift will do for you on those cold windy nights. I know and have been there. Which leads me to ask Brannon to design the next generation of Spindrift with two door with optional zippered dug screens. 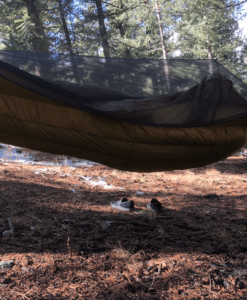 I reviewed the Warbonnet SpinDrift surrounding my RidgeRunner hammock between 14-22 degrees outside winter temperatures (see below YouTube link for video review). Unfortunately, there was no rain or hard wind in my test scenario in order to really stress-out the SpinDrift. 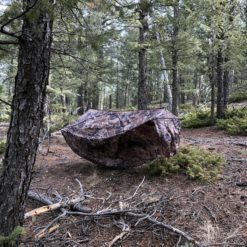 However, it did perform very well by raising the inside temperature by 15-degrees vs. the outside temperature and this can be a real big deal in cold winter, spring, or fall mountain temperatures, especially if the wind is blowing hard and stealing critical heat. I can see using the Spindrift for any over-nighters going under say 45-degrees F, or with the potential of high winds. I also found the door openings well planned, designed, and positioned to make hammock entry and exit fairy easy. Bought the 2 door model for the wife’s RR and she loves it. Only bad thing is I had to buy her another RR ( no net version ) to leave in the sock so she still has her netted RR for when it is warmer out and she does not need the sock as it is a bit of a PITA to change out and put the RR back to stock. I like the idea of adding a zipper to the foot end to make it easier to attach/detach adjust the UQ. Excellent product and if you own a RR you should get the sock. 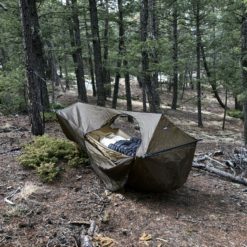 I ordered the spindrift just in time for my winter backpacking adventure. The plans went awry, but I still ended up at campsite covered in snow. I was so excited to use it. 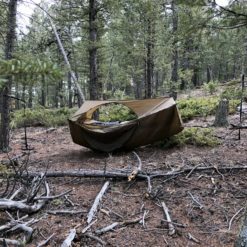 Once I got settled into it, all nice and toasty warm, when I woke up in the night I found the air inside comfortable with no condensation and since it wasn’t going to rain or snow overnight, I enjoyed not having to use a tarp. My only regret is not springing the extra door. Thanks again for yet another great product. I debated getting a Spindrift for a long time, tried a DIY experiment that did not work well and so ordered it. Construction is great and the shipping was quick. 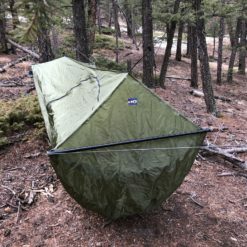 Tested it outside last night in the low thirties and had a nice comfortable sleep, without any condensation, which was a problem with my Clark. i ordered the Spindrift with the 2 doors. Zippers all work well and it fits easily. 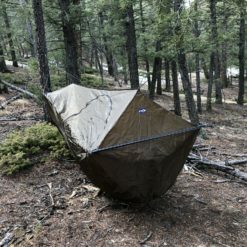 I can see using this as a year round item, especially being able to use it without a tarp. 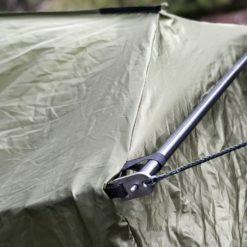 I would hope that Brandon would consider putting a zipper in the foot end to make it easier to install the underquilt and removable bugnet for the doors. The spindrift is fits like a glove. 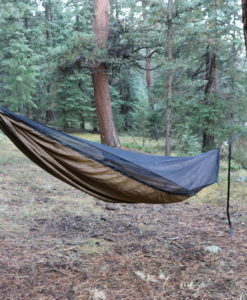 Once installed over the ridge runner, it fits within the provided stuff sack of the ridge runner. The double zipper provide plenty of options for venting. 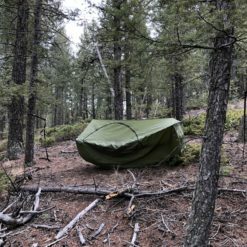 Hope to update the performance when temperatures approach 10 F. Made last season without it, 5 nights 12-15 F with a three season Warbonnet under-quilt and two old light sleeping bags, and oh a down vest helped. This year a new top quilt with the spindrift will lighten my load. 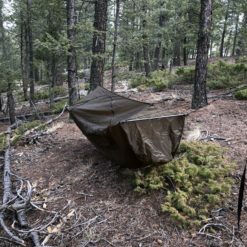 Currently my sleep and shelter system is around 6 lbs. 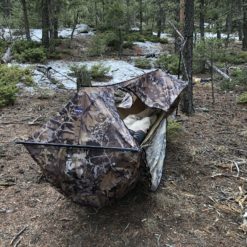 Feel confident I will find comfort down to 0 F. I will follow up after hunting season on why warbonnet is setting standards for others to follow when seeking value, quality, comfort and functionality at a respectable price. 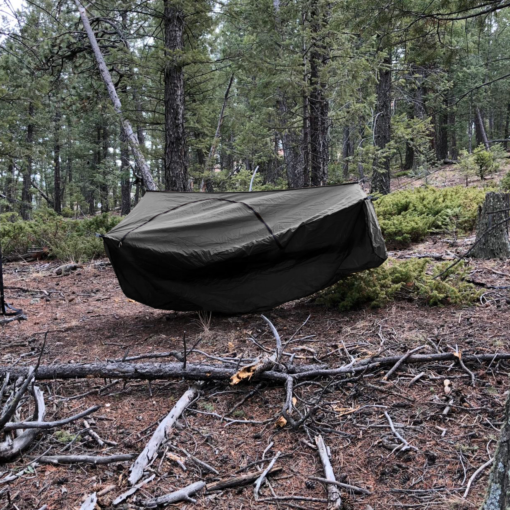 Fits great and does a great job of adding protection form wind, cold and light precipitation. 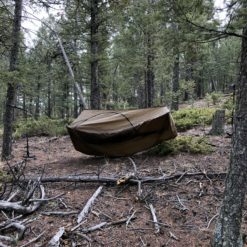 As I primarily camp to rock climb, the weather tends to be dry and this allows me to mostly avoid dealing with digging out a tarp at all. This is a great addition to the Ridgerunner and a great purchase for anyone with one. 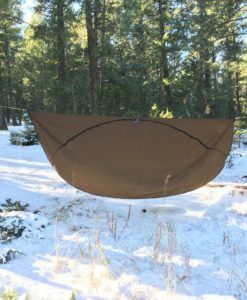 My wife thinks I’m nuts cause I often sleep in my ridge runner on the patio, the spindrift is an excellent touch to break the wind and retain heat, the lynx quilt is cozy for sure……I’m really enjoying my warbonnet stuff!! I have to be honest when I bought the Spindrift I did not think I was going to like it as much as I do now. It kept me very warm inside a very windy cold snowy night, during the 2deg polar vortex. I don’t think that I will be taking it off until it gets hot outside. This company is solid!!! I rcvd the two door multicam Spindrift for use with my Ridgerunner. l like the fact that Brandon listens to his customers and made the two door version an option. Installed on the Ridgerunner — it works brilliantly. Instead of removing the shock cord from the mosquito netting to use on the Spindrift, I just made add’l shockcords for the Spindrift which will stay there permanently. 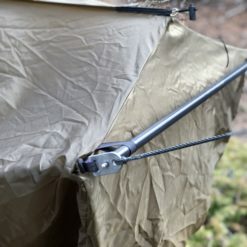 Brandon has a very good video on the site as to how to install the Spindrift on the Ridgerunner. I did replace the Apex buckles with Dutch biners and that makes removing the suspension to install the Spindrift easier. As I sometimes use a pad in my DL Ridgerunner, I am having a seamstress put in a 30 inch zippered opening in the Spindrift sock below the spreader bar on the head end. 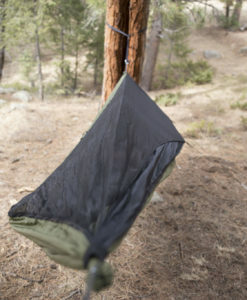 This will allow me to keep the Spindrift on when I pack up the hammock but be able to slide the pad in when I hang it the next time without having to take the Spindrift off (or partially off). I might bug screen the doors eventually as well. 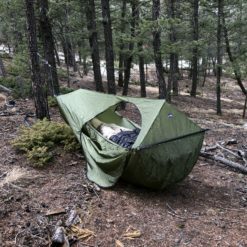 Warbonnet is probably thinking that the Spindrift is a cold weather accessory for the Ridgerunner but I am thinking of using it year ’round and just keeping it installed all the time. The addition of the zipper for the pad and mosquito netting for each of the two doors would make this possible. It would be nice if Warbonnet could make these two options available in addition to the two door option but I don’t know if the demand is there to justify those add’l options. 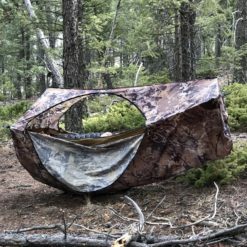 The Spindrift is an excellent addition to the Ridgerunner and would allow the use of a somewhat smaller tarp as well.